The S-Hook and chain allow you to dry hop or cold brew utilizing our dry hoppers for corny kegs. 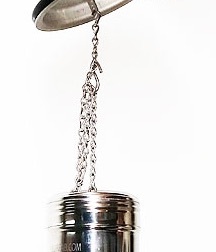 The chain and hook require a lid with a welded tab underneath the corny keg lid (NOT INCLUDED) to attach to the chain. The stainless steel S-Hook enables you to adjust the length of the stainless steel 12" chain.